Articulates with great dexterity to shine in a myriad of places, and morph into a wide variety of shapes! This is a very nice, very unusual mid-century "gooseneck" BRASS FLOOR LAMP. There are two dents on the brass base as shown in photos. The lamp is in working condition just needs a shade. We are always out treasure hunting. Cedar Creek 4-arm table lamp in Plantation Red with shade. One standard socket on top (150 watt bulb maximum) and four candelabra sockets (60 watt bulb maximum per socket). Handcrafted in Pennsylvania. 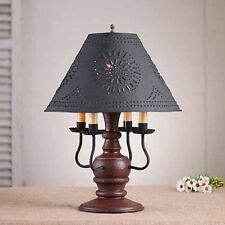 Outstanding antique turned wood floor lamp from the Arts and Crafts era. . The lamp has a multi color finish with brass hardware. The lamp has dual brass pull chain sockets. 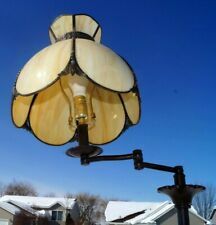 I mistakenly did not photograph the lamp with its finial but it does have an ornate finial as seen in the last picture. The antique lamp has new wiring and the vintage sockets are working fine. A nice size measuring 60 inches tall and the lamp displays impressively. Thanks for looking!. SEE PHOTOGRAPHS FOR BEST GUIDE TO CONDITION. UNWANTED GIFT - PROBABLY NEVER USED. Sized to impress (over six feet tall!). Hundreds of individually sculpted feathers surround a breathtaking 360-degree sculpt cast in quality designer resin, finished in faux bronze and culminating in a frosted cream glass shade. Late 1800 to early 1900s Brass floor lamp with very rare aluminum deflectors. small crack in first brass piece on bottom. Rewired and updated. so that they can be used as intended. Cedar Creek 4-arm table lamp in Sturbridge Black with shade. One standard socket on top (150 watt bulb maximum) and four candelabra sockets (60 watt bulb maximum per socket). Handcrafted in Pennsylvania. Mid Century Modern Teak Brass Floor Lamp Danish modern Retro Shades Outstanding! We are a dealer in General Antiques, we are not an expert in every category of antiques. Cedar Creek 4-arm table lamp in Espresso w/ Salem Brick Stripe and Shade. One standard socket on top (150 watt bulb maximum) and four candelabra sockets (60 watt bulb maximum per socket). Handcrafted in Pennsylvania. Very minor wear to lucite and brass. Glass shade has original label that says Venice Glass - Hand Made In Italy. This is a really cool light in working condition. This can be used as a regular lamp with the switch on the ultra violet setting using a regular light bulb. It attaches with one small screw that will be provided. One standard socket on top (150 watt bulb maximum) and four candelabra sockets (60 watt bulb maximum per socket). Handcrafted in Pennsylvania. Our Goal is to provide the best quality and selection of primitive, country, and rustic style products on the web. Lava multi color dripped glaze with skinny neck. excellent condition - lamp base only (no electrical fixture). Mid-Century Modern. Our goal is to send zero waste to landfills, of the thousands of textiles & goods that people throw away every year, as much.as 95% could be re-worn or recycled or re-used. The artist casts his sensuous maiden in quality designer resin with an antique stone finish while fashioning her graceful peacock s feathers out of frosted glass that sparkles with the help of a single, 25-watt candle bulb illuminated by switch on cord. Bottom stamped #G1080 SJEO1290 UL portable Lamp issue No. 8J-15,510. Mid-Century Modern. Light scratching on base and shade, as pictured. Otherwise, excellent working condition. We do our best to show accurate color although colors may be slightly different from our computer to yours. Handsome antique cast iron floor lamp from the 1920's era. The lamp is quite ornate with a twisted stem and dual sockets. 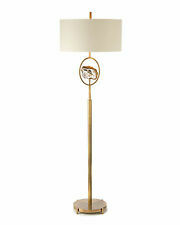 The floor lamp has a beautiful gold finish and matching etched antique shades. The antique lamp has new wiring and the vintage sockets are working fine. A nice size measuring 63 inches tall. This lamp is ready to use and display, it will go great with antique furniture. Thanks for looking!. 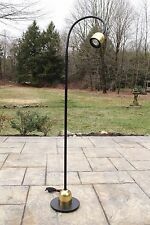 MID CENTURY MODERN WEIGHTED TRUMPET~SAARINEN STYLE FLOOR LAMP / LAUREL~NESSEN?? ONLY NOTICABLE UP CLOSE ( NOTHING MAJOR ). THE SIDE EDGE OF THE BASE HAS A COUPLE OF MINOR RIPPLES ( THE ONE IS SHOWN. AGAIN NOT BAD ). TAKES A STANDARD BASE BULB. IT STANDS IS 64 1/4 " TALL X 11" ACROSS THE BASE, AND THE TOP PORTION IS 8 1/4" ACROSS. I haven't seen another like it. BLACKFOOT TRAIL GALLERY. Base 11.5" x 7.25" Height extends up to 58" Arm 15". (NOT UNCOMMON FOR THIS STYLE OF ASIAN LAMP SHADE). Very very nice. It is to large to send via fed ex therefore it must be sent with a carrier. Color may slightly vary due to photography and or flash. "mom, your stuff is old junk". Uses single halogen bulb. PLACE OF ORIGIN. Our goal is to send zero waste to landfills, of the thousands of textiles & goods that people throw away every year, as much.as 95% could be re-worn or recycled or re-used. 55" tall to the top of the finial. One loose knob on the table tray section. Heavy brass base. Table section is 20 1/2" from the floor. Table section is 17" wide with 1/2" thick glass. Item will be carefully wrapped. Two of the Swivels in the last Picture iswill only hold a very light shade. I am not sure how they work due to the threaded end is smaller than the norm. Stands 62 1/2" tall - base 16" x 9" - ORB 6 1/2" wide. Works great, original plug, slight scratches on orb but nothing major. Normal wear for age. Mid-Century Modern. Our goal is to send zero waste to landfills, of the thousands of textiles & goods that people throw away every year, as much.as 95% could be re-worn or recycled or re-used. Put a flying saucer shade on it to complete the look. Many factors combine to make the Stiffel Difference. Of course there is the obvious beauty and form of the piece, but that is just the beginning. A Stiffel lamp is that exceptional creation born of a perfect balance between inspiration, design and integrity. 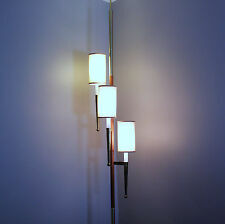 Vintage Mid Century Modern 1960's Metal Brass Toned Spring Loaded Extension Pole 3 Light / Lamp. 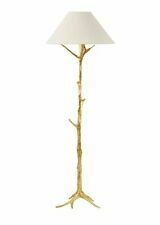 Lamps are adjustable and have a metal brass/gold plated appearance with wood finials and decorative wood trim section. A 3 position switch turns on one lamp, then two, then 3. The base and top of pole have end cap/foot intact. Light breaks down easily into 3 sections and comes unplugged. Cosmetically lamp shows scratches, surface wear, tarnish/rash appearance in few spots and on tension section (see pics). Dimensions are approximately 96"-102" or 8-8.5 ft. total length. Each section measures 35",35" and 38" . Lamp overall is in good condition and would look great in your home or office. 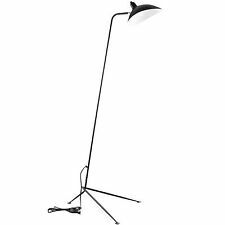 MCM Vintage Tension Pole Floor Lamp Adjustable Black Pierced Metal Cone Shades. Great working condition for its age. Some wear to brass finish as is expected for a piece this old. Extends to about 8’ tall. In the photos it is installed in a 9’ tall room, hence the brick under the bottom. Spring works, top and bottom parts are fine. This lamp is heavy and will be shipped in its pieces. Careful packaging and smoke free home. I accept PayPal and usually ship within one business day of payment. Local pickup also available. Thanks for looking. Cast iron and brass. Original finish. Petite, only 42 1/2" high. Real nice old light. Cast iron base and bridge. Brass column sleeves, spacers, fitter, and fitter screws. Joints snug. Easy to re-attach. Marked on base S.P. 1058. Has a old porcelain MOGUL socket. I believe this is cast iron based off similar pictures and listing on this site. I can not say for sure what metal this is made out of though. This came out of my late grandfathers estate. I’m not sure exactly how old it is. Will need a cleaning and to be rewired. See pictures.